"21 Jump Street," a reboot starring Jonah Hill and Channing Tatum as cops going undercover as high school students, took down "Dr. Seuss' the Lorax," the top flick the previous two weekends. Audiences headed back to school for the TV update "21 Jump Street," which opened as the No. 1 weekend movie with $35 million. Sony's action comedy starring Jonah Hill and Channing Tatum as cops going undercover as high school students took down the animated hit "Dr. Seuss' the Lorax," which had been the top flick the previous two weekends. Studio estimates Sunday put Universal's "The Lorax" in second-place with $22.8 million, raising its domestic total to $158.4 million. At No. 3, Disney's costly sci-fi dud "John Carter" dropped sharply in its second weekend. The Edgar Rice Burroughs adaptation took in $13.5 million, down 55 percent from its anemic opening weekend and lifting its domestic total to a measly $53.2 million. "John Carter" reportedly cost $250 million to make. While tanking in the United States, "John Carter" has done decent business overseas. It took in $40.7 million this weekend to push its international haul to $126.1 million and its worldwide total to $179.3 million. In narrow release, Will Ferrell's Spanish-language B-movie spoof "Casa de mi Padre" opened solidly at No. 9 with $2.2 million. 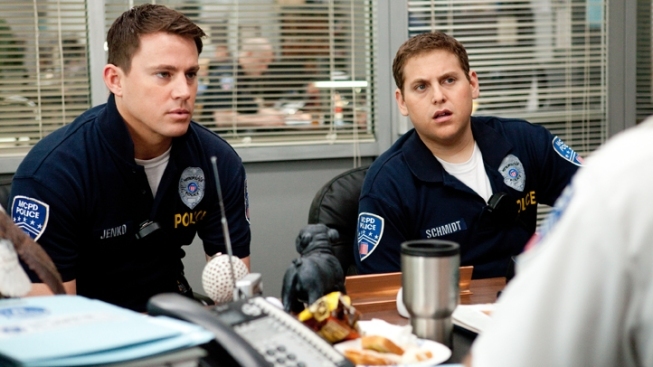 The Lionsgate release played in just 382 theaters, compared to 3,121 for "21 Jump Street." Based on the 1980s TV show that made Johnny Depp a star, "21 Jump Street" casts Hill and Tatum as rookie cops posing as teens to root out crooks peddling a psychedelic new drug at a Los Angeles school. Rather than doing a straight update of the TV show, Sony turned "21 Jump Street" on its head for the big-screen, retooling it as a comedy that helped pack in the under-25 crowd, which made up half of the audience. "I just think you had to make it relevant, and action comedy was the way to go. And they did make it very relevant to a young audience," said Rory Bruer, head of distribution for Sony. "The guys, Jonah and Channing, were just killer together. They had incredible chemistry and certainly were the attraction for younger crowds." Hollywood's box-office hot streak finally cooled off a bit, with overall business down for the first weekend this year. Domestic revenues totaled $108 million, off 6 percent from the same weekend last year, according to box-office tracker Hollywood.com. That's likely to be just a hiccup for Hollywood, though, with business expected to soar again next weekend as the adaptation of the best-seller "The Hunger Games" hits theaters. Hollywood.com analyst Paul Dergarabedian said "The Hunger Games" could have an opening weekend well above $100 million and might surpass the $116.1 million debut of 2010's "Alice in Wonderland," which holds the record for best domestic premiere in March. Dergarabedian attended "The Hunger Games" premiere and said that "fans were lined up, camped out for days. I hadn't seen that since the 'Twilight' movie. But unlike 'Twilight,' which was dominated by the female audience, there's huge interest from males in this movie." With a huge summer season ahead that includes the superhero tales "The Avengers," ''The Amazing Spider-Man" and "The Dark Knight Rises," Hollywood has a strong shot at setting a revenue record this year. So far, domestic revenues are at $2.16 billion, 16 percent ahead of last year's. 1. "21 Jump Street," $35 million. 2. "Dr. Seuss' the Lorax," $22.8 million ($14.1 million international). 3. "John Carter," $13.5 million ($40.7 million international). 4. "Project X," $4 million. 5. "A Thousand Words," $3.8 million. 6. "Act of Valor," $3.7 million. 7. "Safe House," $2.8 million ($3.5 million international). 8. "Journey 2: The Mysterious Island," $2.5 million. 9. "Casa de mi Padre," $2.2 million. 10. "This Means War," $2.1 million.